Mauricio “Shogun” Rua is set to fight Brandon Vera on the UFC on FOX 4 card which will be held on August 4, 2012 at the Staples Center in Los Angeles, California. Shogun may be coming off a loss but we have to remember that it was an epic 5 round war against Dan Henderson, which won Fight of the Year honors. He will be walking out in the Bad Boy Shogun UFC on FOX 4 Walkout Shirt, which features a traditional Shogun colorway of blue, green and yellow. 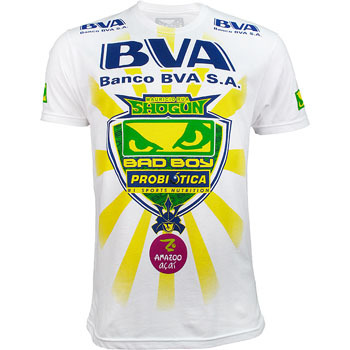 It has all the logos of Shogun’s sponsors for his fight that night including Banco BVA, Probiotica and Amazoo Acai. There is the Shogun icon graphic on the back as well as Bad Boy logos and Shogun text across the shirt. It is a fitted shirt so if you want it a bit loose, order a size up. The Bad Boy Shogun UFC on FOX 4 Walkout Shirt is available at MMA Warehouse.